“10,000 murders in 10 months” screamed the headline of Mexican daily La Reforma (Reform) this week, drawing attention to the cost of cyclical violence which has in recent years brought misery to a country already suffering from entrenched poverty and social disenfranchisement. The figures will surprise few observers, but nonetheless represent a shocking toll in a country with a population less than twice that of Great Britain. The report contained the caveat “until yesterday” underneath the alarming statistics, a necessary inclusion in a land where an average of 33 murders are committed every day: more than one every hour. The numbers are already outdated, as a shallow grave containing 18 bodies was discovered in the Pacific city of Acapulco on Wednesday. The corpses are thought to belong to a party of Mexican tourists from the state of Michoacán, who had been missing since the end of September. Incidents of this nature have become commonplace as rival gangs involved in the lucrative drug trade battle for dominance, with ordinary citizens invariably caught in the crossfire. Cartels have targeted politicians and police chiefs at will and with little danger of retribution, to the point where some sitting mayors in the northern border states have chosen to relocate to the United States and carry out their duties over the phone or by commuting to the towns they serve. Murder statistics have been steadily increasing since President Calderón announced a crackdown on cartels shortly after taking office in late 2006. 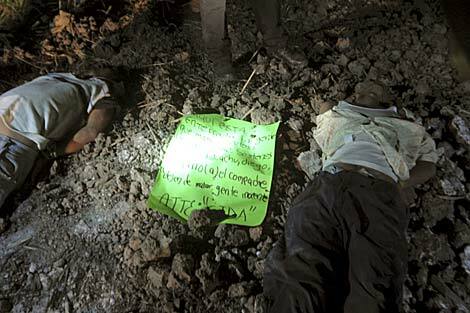 There were 2,275 murders in Mexico in 2007, followed by 5,207 in 2008 and 6,587 in 2009. Authorities have struggled to combat armed groups in no small part due to corruption within their own ranks, as police officers on meagre wages are routinely enticed to provide impunity to cartels and to pursue rival groups by way of financial incentives or under threat of violence, or a combination of the two. Those local officials who do make a point of attempting to root out corruption and violence in their districts are targeted and often killed in brutal fashion in order to send a message to others who might be tempted to interfere with cartel business. A breakdown of the 10,000 killed so far this year shows that 798 of the victims had been tortured and 326 decapitated. There were 637 police officers among the dead, 52 state soldiers and 276 adolescents. Statistics show that more and more people with no connection whatsoever to either state forces or cartels are being killed, either in retaliation or as a result of mistaken identity, however the bulk of the dead is comprised by young males involved in clandestine criminality. Of Mexico’s 32 states, only south-eastern Yucatán was immune from the wave of drug-related homicides. However, violence is far more prevalent in the region bordering the United States than in most of the country. Observers note that while Mexico’s police force has always suffered with underfunding and comparatively high levels of corruption, “narcodollars” have taken a horrendous toll on overall security and have compromised significant elements of the country’s law enforcement bodies. On Sunday seven people aged between 20 and 25 were killed and one wounded following an attack on a house in Ciudad Juárez, one of Mexico’s most notoriously violent municipalities which sits just over the border from the U.S. town of El Paso, Texas. Juárez experienced its most bloody month so far this year in October, with 300 people falling victim to murder in a city of around 1.4 million. 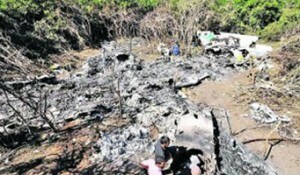 There were no survivors as a plane operated by Cuban state carrier Aerocaribbean crashed on Thursday morning in the province of Sancti Spíritus, with all 61 passengers and 7 crew on board perishing. The ATR-72 craft had been making a charter flight from Santiago de Cuba, the island’s second city, to the capital Havana, and the cause of the crash is still not known, with authorities delaying the removal of debris from the site until further conclusions can be drawn. There were 40 Cubans and 28 foreigners, including nine Argentinians and seven Mexicans, among the dead. It is the largest air disaster involving an Aerocaribbean plane since the company’s founding in 1982. The crash surpasses the company’s hitherto most deadly crash which took place in 1992 when 34 people including the Dominican national chess team died after an Aerocaribbean flight went down in the Dominican Republic. Eyewitnesses reported seeing the plane make sudden movements in the air before descending sharply into mountainous terrain and bursting into flames. It has been reported that Flight 883 had taken off in adverse weather conditions, with tropical storm Tomas threatening to hit the east of the island in due course, however the Cuban Aeronautical Institute said it was too early to substantiate the reason for the disaster. Aero Caribbean is owned by the Cuban military but functions as an exclusively civilian carrier. 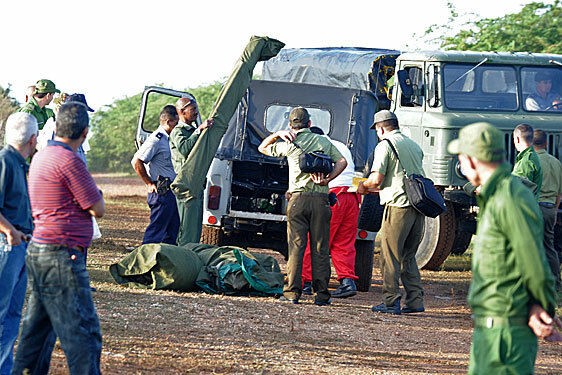 It is the first air crash involving a Cuban plane for eight years. In 2002 a Soviet-era Antonov plane containing 16 people, including four British tourists, crashed en route to Cayo Coco, a popular tourist destination to the north of the mainland, leaving no survivors. The plane involved in the most recent tragedy was of Franco-Italian construction, having been sold to the Cuban government by manufacturer Avions de Transport Regional, and had racked up 25,000 flying hours on more than 34,500 separate flights since 1995. 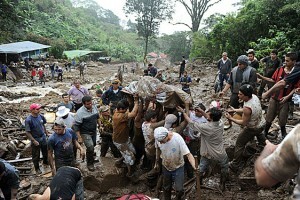 21 people were killed and a further 30 are missing following a landslide in the west of the province of San José, which also contains the nation’s capital city. Heavy rains had hit the region earlier in the week, and houses and vehicles in the district of San Antonio de Escazú were buried under mounds of earth and stone which slid two kilometres down a hill in the area, crushing everything in their path. The head of the country’s National Meteorological Institute, Werner Stolitz, said that Costa Rica had suffered its worst rainfall “in years”, and that three times the average total rainfall for November had fallen in just a few days. Four more people were killed in other incidents, bringing the confirmed death toll since rains began last Tuesday to 25. The National Emergencies Commission has already evacuated 3,750 people from affected regions, and classes were suspended for pupils at state schools in the centre of the country and on the Pacific coast. In the affected zones 800,000 people are without drinking water following damage to infrastructure by heavy rainfall, which also destroyed sections of highway and caused several bridges to collapse. High-risk areas are now under red alert, with the government warning that adverse weather conditions should not be taken lightly. The Venezuelan ambassador to Spain, Isaías Rodríguez, has accused Spanish border patrol agents of “verbally abusing” him as he returned to Madrid from Caracas. Rodríguez was held up for 15 minutes at Madrid’s Barajas airport, where he claims border guards dealt with him “in a manifestly hostile and disrespectful manner”. A communiqué issued by the Venezuelan Embassy said that a border control agent shouted “get lost” to the ambassador when he attempted to present his passport. When he protested at the perceived mistreatment, he was surrounded by Spanish police who took his passport from him, returning it 15 minutes later without explanation. The embassy said the incident further evidenced the “hostile, abusive and impolite attitude which some of the staff at Barajas airport display towards Venezuelans travelling to Spain.” The airport attributed the sequence of events to a “misunderstanding” regarding the ambassador’s arrival time. Accusations of mistreatment and heavy-handedness against Spanish border guards are not a new phenomenon. In March 2008, a planeload of 30 Brazilians including students due to attend a conference in Portugal were denied entry to Spain and were returned to Brazil despite presenting official documentation which legally entitled them to enter the Iberian country. This incident sparked a diplomatic row which saw Brazilian authorities retaliate by denying several Spaniards entry to the country. Over 3,000 Brazilians were prevented from entering Spain in 2007, despite having adequate documents in many cases. Tensions between Madrid and Caracas have run high in recent weeks after Spanish MPs accused Venezuelan President Hugo Chávez of having links to ETA, the armed Basque separatist group which has repeatedly targeted attacks at civilians in Spain as part of an ongoing insurgency which seeks total autonomy for the Basque country. 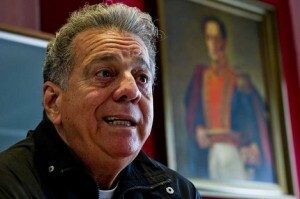 Chávez called the accusations “tendentious”. Ambassador Rodríguez caused a stir in Spain a month ago when he implied that two members of ETA who had “confessed” to receiving training in Venezuela had done so under duress. He maintained that he had “serious doubts” as to whether or not the confessions had been made “entirely voluntarily”. President Chávez has attracted the ire of the Spanish establishment before. In late 2007, King Juan Carlos I of Spain famously exclaimed “why don’t you shut up?” at the Venezuelan leader who had been interrupting a speech made by Spanish Prime Minister José Luis Zapatero at the Ibero-American Summit in Santiago, Chile. Look, if he did a tune about guns, drugs and how bad he was, most of you would salute him as some kind of grime genius, you need to give him time to grow, at least he’s talking about something that can make the youngers think, think bigger about where they fit in in this society, you need to give him time to articulate he’s reality and not try to put him down at the first post, even if you don’t agree with he’s point of view it refreshing. Well done playa, keep up the good work. MCD Silent Eclipse.